When you breathe in smoke that comes from the end of a lit cigarette, cigar, or pipe ( often described as ‘sidestream smoke‘ ), or when you breathe in smoke that is exhaled by a smoker(often described as ‘mainstream smoke’ ), you are exposed to the risk of secondhand smoke. You will be inhaling almost the same amount of chemicals as the smoker breathes in. Tobbaco smoke contains more than 4,000 different chemical compounds, and more than 50 of them are known to cause Cancer. Some of these known carcinogens are Hydrogen Cyanide, Benzene, Formaldehyde, and Carbon monoxide. Involuntary or passive smoking can kill. There is no amount of exposure to secondhand smoke that is considered as a safe level of exposure. The more secondhand smoke that you breathe in, the more your health risk increases. Secondhand smoke exposure causes nearly 50,000 deaths per year in adult nonsmokers in the United States. 3,000 deaths are from Lung Cancer, and 46,000 deaths are from heart disease. Nonsmokers increase their risk of developing Lung Cancer by 20% to 30%, and heart disease by 25% to 30% when they are exposed to secondhand smoke. The risks of Breast Cancer and Cervical Cancer and other types of Cancer are also higher. Women who are exposed to secondhand smoke face a 69% higher risk of heart disease and a 56% higher risk of Stroke than those who are not exposed to smoke. Children are particularly vulnerable to the effects of secondhand smoke because of their bodies are still growing and they breathe at a faster rate than adults. The effects of smoking can be very significant especially for those who live or work with a smoker. In reality, most of the smoke from a burning cigarette doesn’t get sucked down into smoker’s lungs- it simply escapes into the air where it can be inhaled by anyone unfortunate enough to be nearby. Living under the shadow of a great person may give some benefits, protection, and a sense of security. But, life under the shadow of secondhand smoke is a prescription for death. There was such an unfortunate victim who had lived under the shadow of a great leader known as Mohammed Ali Jinnah. Mohammad Ali Jinnah, Qaid-e-Azam, the great leader and founder of Pakistan. What is the risk of Living under the Shadow of a great leader? 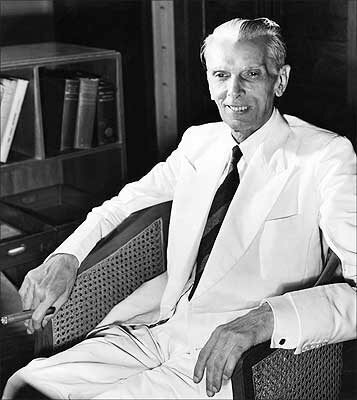 Jinnah, Indian Muslim politician was the founder and first Governor General of Pakistan (1947-1948). His parents arranged for an early marriage for him before he left for England at the age of 16. 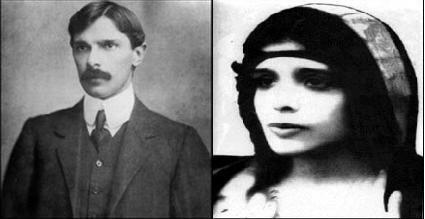 While in London, Jinnah suffered the loss of his wife and mother. In 1895, at the age of 19, he was called o the Bar on completion of his formal studies to become a barrister. He had supported the election of Dadabhai Naoroji, a Parsi leader, a leading Indian nationalist who ran for the English Parliamnet. Naoroji became the first Indian to sit in the British House of Commons. In 1896, Jinnah returned to Karachi and then moved to Bombay to start his legal practice. He met Ruttenbai, the daughter of Dinshaw Petit, a Bombay Parsi millionaire. 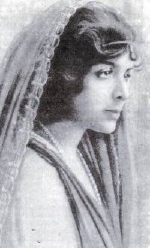 Jinnah had married this young and beautiful lady over tremendous opposition from her parents and others. The great love and the marriage withered and proved to be an unhappy union. The stress imposed by exposure to secondhand smoke was not known and was not recognized those days. Jinnah’s addiction to Tobacco and the price paid by his wife describe the other side of Jinnah which many people in Pakistan and India tend to ignore. 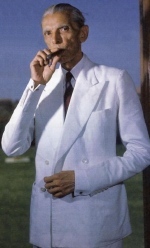 Jinnah, a great leader with a simple addiction to Tobacco. This young and beautiful lady had great feelings of love for Jinnah and those tender feelings withered while she had lived under the Shadow of Secondhand Smoke. risk of Lung Cancer due to Secondhand Tobacco Smoke was not properly recognized. 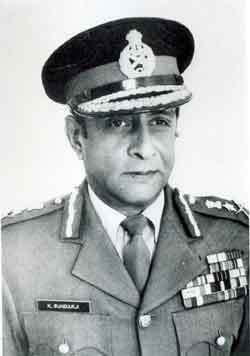 The Chief of Army Staff, General Krishnaswamy Sundarrajan, PVSM - I had served under his Command while he was the General Officer Commanding of the First Armoured Division during 1976 to 1978. His first wife, Padma Sundarji had lived her life under the shadow of Secondhand Smoke. M.B.B.S., Class of April, 1970. Sarojni Naidu was a huge admirer of Jinnah, wrote several poems and prose pieces on him, and many historians believe she was in love with him. Marseilles 5 Oct 1928 Darling – thank you for all you have done. If ever in my bearing your once tuned senses found any irritability or unkindness – be assured that in my heart there was place only for a great tenderness and a greater pain – a pain my love without hurt. When one has been as near to the reality of Life (which after all is Death) as I have been dearest, one only remembers the beautiful and tender moments and all the rest becomes a half veiled mist of unrealities. Try and remember me beloved as the flower you plucked and not the flower you tread upon. I have suffered much sweetheart because I have loved much. The measure of my agony has been in accord to the measure of my love. Darling I love you – I love you – and had I loved you just a little less I might have remained with you – only after one has created a very beautiful blossom one does not drag it through the mire. The higher you set your ideal the lower it falls. The second time Jinnah ever broke down was in August 1947 when he visited Ruttie’s grave one last time before leaving for Pakistan . The architect of Pakistan paid a high price for Partition by leaving two of his most beloved possessions on ‘the other’ side of the border, the Jinnah House on Malabar Hill where he had the happiest moments of his life, and his beloved wife Ruttie who remains buried in Bombay. Jinnah left India in August 1947, never to return again, but he left behind a piece of his heart in a little grave in a cemetery in Bombay . Pingback: SET YOUR MIND FREE – LET YOUR THOUGHTS FLOW | Bhavanajagat. Pingback: HUMAN EXISTENCE – A STORY FROM MILITARY HOSPITAL AMBALA | Bhavanajagat. Pingback: DEFINING INDIAN IDENTITY – LIFE UNDER THE SHADOW | Bhavanajagat. Pingback: HUMAN EXISTENCE IN THE AGE OF STRESS | Bhavanajagat.